University and faith leaders have encouraged the community to stand strong for inclusiveness and cross-cultural respect on the eve of Harmony Day. 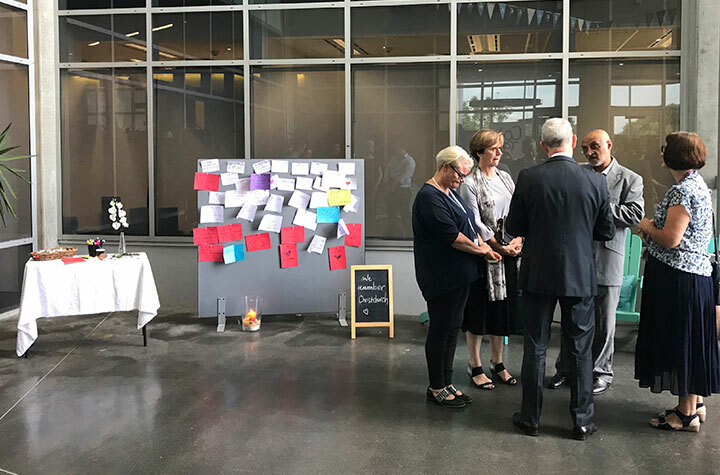 Southern Cross University hosted an official visit from President of the Queensland Islamic Association, Mr Habib Jamal, at the Gold Coast campus on Wednesday to speak at a remembrance ceremony in the wake of the Christchurch massacre. Ceremonies of remembrance and respect were hosted at each campus, with staff and students standing together in solidarity, condolence and compassion with New Zealand. “While it is a time of profound sorrow, it is also a time in which we reassert our values of peace, non-violence, connection and cross-cultural respect,” Vice Chancellor Professor Adam Shoemaker said. Mr Jamal said that there had been an outpouring of grief and sorrow but also respect and a new understanding. “My plea to the students and staff here, and to everybody, is to make a point of understanding other people’s religions, reading up on what other people believe, to get a better understanding,” he said. Since the terror attack on two mosques in the New Zealand city of Christchurch, in which 50 Muslim worshippers were killed and many injured during Friday prayer, messages of support and solidarity from across the globe have reached New Zealand. This week Southern Cross University Gold Coast staff and students have written messages of love and support for the victims, their families and anyone affected in the Southern Cross community on a remembrance board in the gathering space on campus. One poignant message, a handwritten note, said ‘we are you and you are us’. Head of Southern Cross University Gold Coast campus and Dean of the School of Business and Tourism Professor Robin Stonecash also spoke at the ceremony. Professor Stonecash reflected on New Zealand Prime Minister Jacinda Ardern’s comments that many of those affected are members of migrant communities who came searching for freedom, including freedom of religion, and a place to nurture their families. “We cannot know your grief, but we can walk with you at every stage,” said Professor Stonecash, quoting Prime Minister Ardern. Southern Cross University Pastoral Care Coordinator Kate Morris thanked Habib Jamal for his great work and the mission of the Queensland Islamic Council of Queensland, which facilitates collaboration between the Muslim community and the public.